Pomegranate peel is usually discarded. The peel is healthy for the skin. Protect your skin with pomegranate peel. Have you started observing fine lines and wrinkles around your eyes? It’s time that you start taking good care of your skin before it gets too late. Did you know that the fruit and vegetable peels you have throwing away in the bin can do a lot of good to your skin? Yes, these natural peels are known to be beneficial for skin, however, we don’t give a second thought before discarding them. 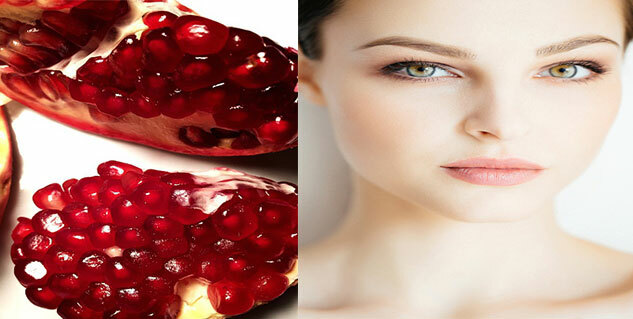 Are you aware of benefits of pomegranate peels? Here is why you should seek its help! Pomegranate peels contain several antimicrobial and antioxidant properties, which make it an effective remedy for skin infections. Besides, the astringent properties are known to stimulate the skin, making it glowing and looking younger. The antioxidant and astringent properties of this peel reduces the size the pores and tightening skin, preventing your skin from sagging and hence is a good anti-ageing home remedy. According to a study published in the Journal of Ethnopharmacology pomegranate peels aid the progress of skin repair and promotes regeneration of the dermis. How to use pomegranate peels? Pomegranate peels can be used in the form of powder. You can store the powder for months in an airtight container and use it to prepare face masks at home in future or can add it to facial scrubs or other face packs. Grate the pomegranate peel and crush it. Now add 2 tablespoon of cream and 1 tablespoon of chickpea flour to 1 tablespoon of crushed peel. Mix all the ingredients thoroughly and apply it on your face and neck. Leave it for 30 minutes and wash off with lukewarm water. Another way to use fresh peel crush is to mix dry pomegranate powder into rose water to prepare a paste. Apply the paste on your face and neck and allow it to dry. Wash with lukewarm water and moisturize. Try this face pack and look younger.